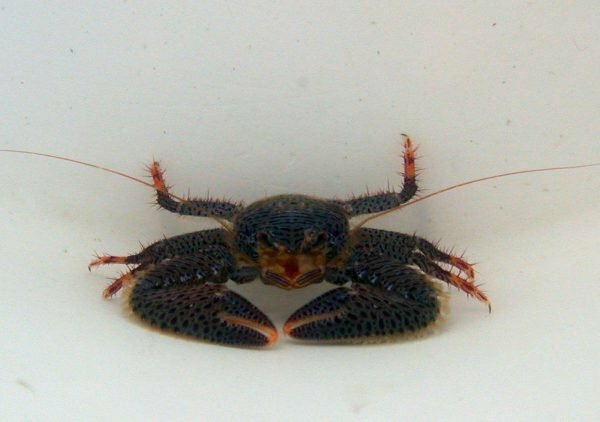 Porcelain crabs, genera Porcellana and Petrolisthes, are interesting crabs that are popular with many reef aquarists. Porcelain crabs, genera Porcellana and Petrolisthes, are interesting crabs that are popular with many reef aquarists. They are filter feeders and spend most of the day scooping water with two scoops that are located under their claws, near their mouths. They are reef safe and can be kept with all other reef critters (except octopus of course). I ordered one of these and got one that looked like the photo and a smaller one that looked a little whiter for free! Really cool guys with their big pincers. I was scared to handle them but they were fine. As soon as they went in the tank they found a little spot and there they stay guarding their domain! Cute little crab, healthy, nice color and nice and active the second he got into the tank. I have had one for over a year now, he is absolutely awesome, he planted himself in the front of the tank and has been there since I got him. He is a pleasure to watch. I have 2 lobsters and several shrimps and none of them come near his area, he uses his HUGE pincers to ward them off, and off they do go, it’s pretty funny to see the lobster that are4x his size be scared by him. Overall a pleasurable creature to have!!!!!!!!!!!!!!!!!!!!!! I ordered 2 of these guys for my 40G Tank, I had bought one from my Local Fish Store a while back for my Brothers 12G and loved him but, could never find another one. I received the 2 in great condition and I got one that was quite large, I’d say ~2 inches or so and another one that was maybe 1 inch. These guys are awesome to watch if they park out where you can see them. They’ll just sit there and wave their fans around filtering the water for food. The larger 1 I got looked like the one in the picture and the smaller 1 has more of a lighter pinkish/tanish color to it. From my experience with these crabs they are very peaceful, except when something gets in their territory then it’ll usually try to pinch or push it away. I’ve never had it hurt any of my tank mates though. Pretty nifty lil’ invert. Once in the tank, he found himself a spot and settled right in. No problems whatsoever! These are really good looking crabs. This was my favorite invert for a year and now I placed my second order for them this week. I highly recommend this crab and anything that Ken sells. I’ve got one of these guys in a 20 gallon long. He was pretty shy at first, but comes out now after lights out to feed. He’s really interesting. I can’t say enough great things about the critters, prices, shipping and (especially) Ken’s communications and service offered on this site. This fella was huge! I expected much smaller, very pleased with the critter. As soon as I acclimated it, it opeed up its “fans” and started filtering! i must say that i am very pleased. i dont see much of it, but it has brought me much please watching it. I now have three of these in two seahorse tanks, all have turned the prettiest shade of light china blue which contrasts distinctly with their orange filter arms. They are mesmerizing to watch as they fan the water for food and are quite docile inspite of their large (proportionately) claws. Shy for some months but have all started to show more of themselves over the last few weeks. Received my order on time an all alive! Was impressed with how each item was in its separate vacuum packed bag no leaks. Will be ordering again soon! They included free live items also with my oder greatly appreciated!!! !